My brother, Tom and his wife Ilene have a beautiful lake home in South Carolina but really haven’t spent much time there lately. They’re back home in South Dakota to celebrate their 50th high school reunion. (Yep..high school sweethearts) They didn’t have much time to unpack following a three week Viking Ship tour of Europe which included a personal diversion for them to spend a few days visiting our relatives in Norway. It was a visit 18 years later than expected. The three Lund brothers had made plans to travel with our wives to the Old Country during the Summer of 2000. But on Memorial Day weekend that year, Tom was jogging in a park near their New Jersey home when he went down with a brain aneurysm. He was rushed to the hospital and underwent surgery as soon as possible. At first the prognosis was grim..but he rallied and within a few months was back to normal and within a year, had passed all his Continental Airlines exams for a return to the cockpit. On Labor day weekend Linda and I along with sister in law Judy (brother Denny’s widow) enjoyed a leisurely lunch downtown where we got to hear Tom and Ilene’s fun accounts of meeting with our Norwegian cousins on my mom’s side and seeing their pictures. A favorite story they heard while there was of when our Grandfather, John Gruseth, who’d become a successful farmer and family man in Brookings County U.S.A., made a Christmas pilgrimage back to Trondheim from which he left as a boy of 17. I told them I’d written an account of that homecoming in a blog years ago..but they hadn’t seen it. It’s a timeless tale that’s true with just a few author embellishments. Perhaps it’s one worth revisiting. So here goes. When John Gruseth first stepped off the ship’s gangway onto solid ground once again he still had his sea legs and felt a bit wobbly. It had been a long rough voyage across the Atlantic in late December and he was mighty glad to be standing here at Trondheim Harbor on Christmas Eve day 1906. As he looked out across the city he’d known so well as a boy, John could see a few rays from the sun, so low in the southern sky this time of year, reflecting off the beautiful spires of Nidaros Cathedral..Mecca to Lutherans everywhere. His mind raced back to the last time he stood on that same spot 24 years earlier, when he was just 17, and about to board another ship; this one bound for America; taking him away from everything and everyone he’d ever known. John had been born with a spirit of adventure. “No grass growing under that Gruseth boy’s feet,” people used to say. But, as the oldest of two sons, it looked as if it was John’s destiny to inherit and stay on the little hillside family farm at Byneset..even though there were already way too many people trying to scratch out an existence from it. By 1882, thousands of Norwegians had already immigrated to the United States to take advantage of free land being offered to anyone with the gumption to farm and develop it. Not only was it free for the taking but mostly free of rocks and best of all it was FLAT. No more aching ankles from long days standing on steep slopes cutting hay with a scythe. Well, it wasn’t alright with Jonetta who knew once her son stepped aboard that boat.. she’d never see him again.“We’ve got to let the boy go, mother.” Jon Sr. said to his usually stoic wife who, knowing there was no stopping him, allowed a single tear to roll down her ample cheek. 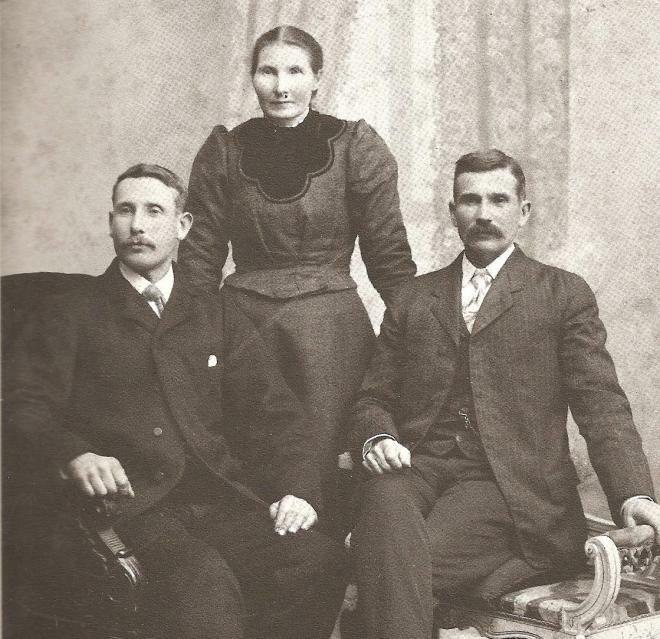 Grandpa John’s Parents, Jon J. Groseth and Jonetta Vevig Groseth both lived to see their son one more time before each passed away in 1908. Well, mother was wrong, John thought to himself as he began the long walk through the snow toward the farm at Byneset to surprise the whole family at Christmas. Traveling along the road he’d known so well as a boy, John reflected on the decision he made to leave so long ago. No regrets, he thought, but it was mighty tough going for awhile. He discovered that America was flat alright but it was also windy all the time, bitter cold in the winter and unbearably hot in the summer. If drought and bugs didn’t ruin the crops, floods and hailstorms would.In those first years, John ached for the mountains of home and the sight of ships sailing on the fjord below Gruseth farm. He was determined to learn and speak English..but it was difficult and made his jaw tired.Eventually, though, through hard work and tenacity, things got better. He met and married a lovely gentle Norwegian girl, Julia Leite, saved enough to buy his own farm just outside of Volga in the brand new state of South Dakota and had become father to four children, two boys and two girls. 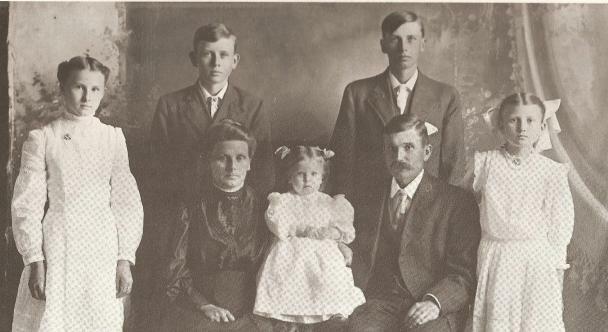 John Gruseth family around 1910. My mom, Gladys, the little girl between grandma and grandpa, was born two years after John returned from his trip to Norway. 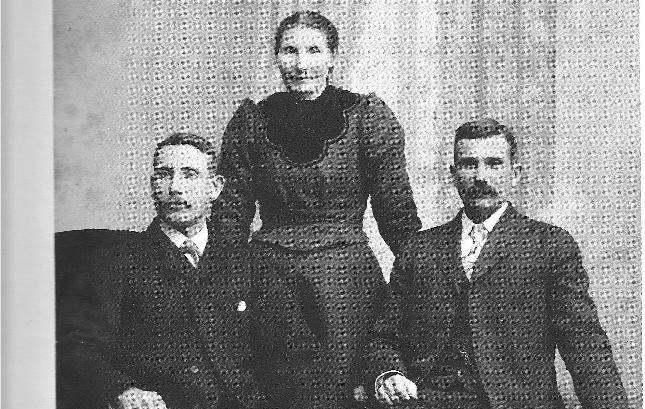 (standing L-R) Alma, Johnny, Clarence and Clara. 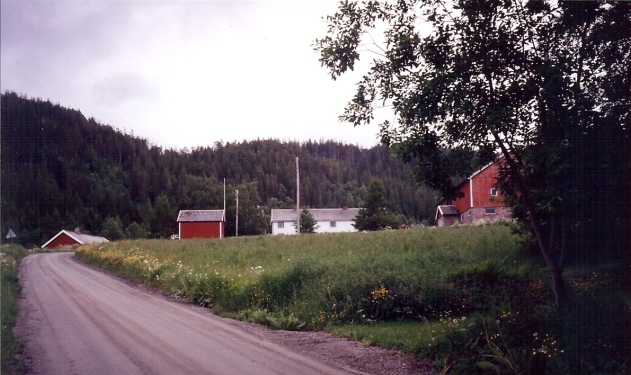 Gruseth farm as it would have appeared to Grandpa John upon his homecoming in 1906. 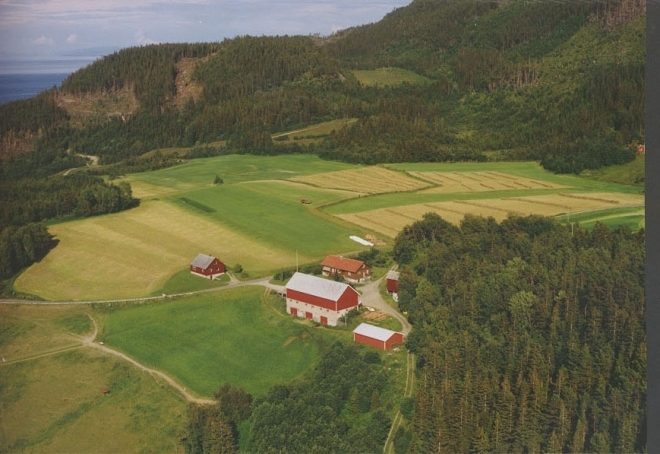 The farm today with the fjord at the top left. Grandpa John stayed in Norway through late February and had this picture taken with brother Anders(left) and sister Ingeborg before getting back on the boat for the long voyage back to America. Grandpa John had brought some prairie grass seeds from South Dakota along on his trip home to Norway and planted them on the home farm. A patch of that “American” grass still grows there today. My cousins Don and Lawrence along with their families were able to make that trip to Norway 18 years ago and enjoy the hospitality of our Nordic cousins. Then, more recently my daughter Patty and Granddaughter, Allison were there followed a couple years later by Daughter Suzan, Husband Joe and Granddaughter, Zoey. Linda and I were in Norway as hosts of a Keloland/Holiday Vacations tour in 1997 but were not able to break schedule to follow in Grandpa John’s footsteps to Byneset. A situation we hope to correct in the near future. 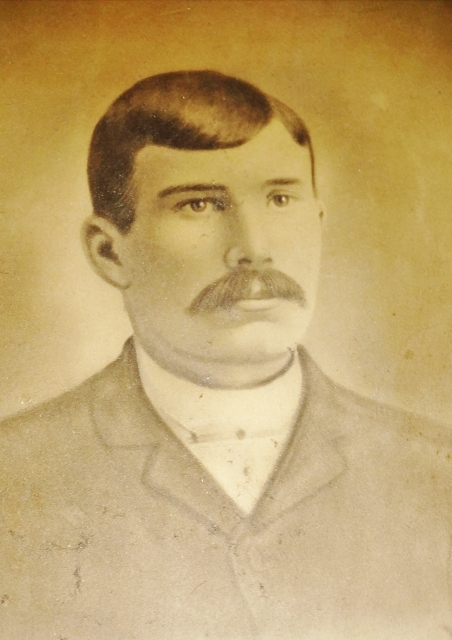 Posted in Uncategorized and tagged Grandpa John’s Parents, Jon J. Groseth and Jonetta Vevig Groseth both lived to see their son one more time before each passed away in 1908.. So well-written, Doug. You take the reader with your Grandpa John. Sue, Kaia, and Kurtis visited our Grandpa Gilbert Mogen’s birthplace this past October. He was born Gullick Groterudson in 1883. We also visited the church where he had been baptized. And so we never forget this story, Lawrence has a video of cousin Olav telling about Johns return visit to his homeland. Yes 2000 was the trip of our life. Such hospitality we have never experienced before. Norway and a quick trip to Denmark to my mother’s birth place. Even got to the church she was baptized at. Even attended a church service at St Micheals aka the Byneset church. Wonderful memories! Such a great time. Only wish the original group could have made the trip with us. They were Don’s two sisters and spouses, and the three Lund boys and their wives. Am glad all have been able to visit grandpa John’s homeland. And for sure you and Linda should go. Make plans!!!! Wonderful story,Doug our families need to know all these stories. And more if possible let me know when you might be going back to Norway.